Fancy yourself as the next Red Baron? Test your combat flight skills against other players with this excellent online game. 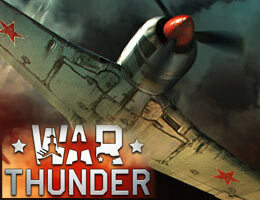 War Thunder is a next generation MMO combat game dedicated to World War II military aviation. Test your piloting skills fighting against other players from all over the world. In the game you fly classic planes from the major super powers of the era (Britain, America, Russia, Germany & Japan). Something that sets this game apart from many other MMO games is the high level of graphics and detail - not something you would expect from a 'free' online game. On the downside there is quite a hefty download required (several gigs), and you will need a semi-decent rig to handle the graphics. As you play you build up currency - 'Silver Lions' - from partaking in dog-fights against other players. With these 'Silver Lions' you can buy better planes and train your crews. Another great feature is how you are able to customise and personalise your planes with decals. There are literally hundreds of planes to unlock, although without paying a fee your progress into the higher ranks becomes increasingly hard and time consuming. Having said that, as a non-paying member you can still enjoy a great range of planes within the lower to mid-level ranks which should suffice for many. Paying members are also able to quickly upgrade and equip their plane armaments using the premium currency - 'Golden Eagles'. Upgrading is also available to non-paying members, but again becomes much harder as you move up the ranks and obtain better planes. It's worth mentioning that the planes you purchase (with 'Silver Lions' or 'Golden Eagles'), are always available to you so you won't lose them when levelling up. When your planes become damaged during a game there is a repair time - that's if you choose not to use your experience points repair them. The better the plane the longer it takes, or more expensive it becomes to repair. This is also influenced by your crews repair skills. One of the first things you should spend your 'Silver Lions' on is to purchase additional crew slots using 'Recruit Crew' button at bottom of game screen. This is good because it allows you to have more planes available per a mission, which equates to you being able to earn more 'Silver Lion' experience. When you become a member you are also given an amount of the premium currency, ie. 'Golden Eagles'. Don't waste these on trying to buy lower rank planes that are only available to the paying members. Rather use them to buy 'Crew XP' which allows you to upgrade the skills of your more crucial crews. This is especially relevant if you're creating bomber crews as the cost of upgrading your 'Number of experienced gunners' is very high. This crew experience is maintained when you replace/upgrade the planes in their slot, so if you are cultivating a bomber crew slot only use it for planes that have additional gunners.